Electric Proportioners for Foam for medium- to high-output foam insulation applications. Equipped with material data and system diagnostics, the Reactor E-20 and E-30 proportioners provide total control for spraying foam insulation. Advanced features provide longer equipment life, more up time for your spray day, and the overall Graco reliability and durability you've come to expect. 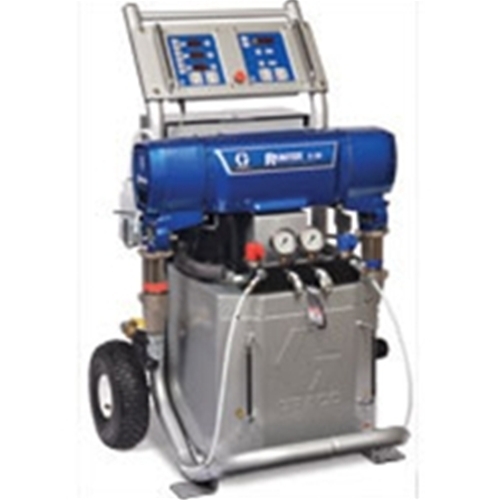 E-20 Package, 2000PSI Max working pressure, 210' max hose length, 190*F max fluid temp., 20lb/min output, 48A-230V, 1-ph, 6.0KW heater, 342lb, Includes spray hose, whip hose, and gun.